If I had to describe Lionville’s sound, it would be in two simple words….’silky smooth’. Most of that is down to Såfsund’s vocals. Since he came on the scene with Work Of Art, his vocals prove to be one of the finest in this genre. 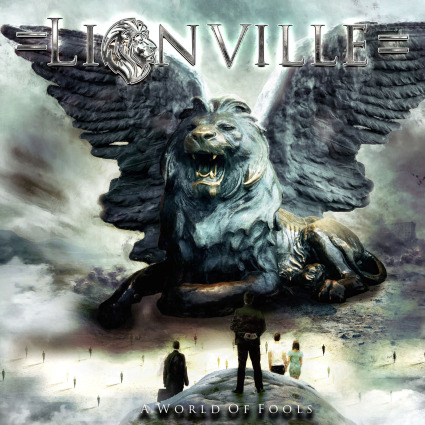 If anything, the quality of songs are what makes or breaks a band, and this is the finest Lionville album yet. Its 80s AOR with a Westcoast vibe that will have fans of Toto and the like in raptures. Its aor-candy for the 21st Century! ‘A World Of Fools’ is consistently good, with a few songs that rise above the parapet into excellent. Their stall is well and truly set out with the pacey and riff heavy opener ‘I Will Wait’. ‘Show Me The Love’ is European pop/rock AOR at its best. ‘Bring Me Back Our Love’ ticks all the melodic rock boxes in abundance, polished sound, hugely melodic chorus, and strong riffage! ‘One More Night’ is one song that is to be played at maximum volume just to show off the infectious chorus and rip roaring solo. ‘Heaven Is Right Here’ follows the same musical path. There’s a lot of positivity in this album, very uplifting any a joy to listen to, as ‘All I Want’ proves. With a song like ‘Livin’ On The Edge’ I expected a rip-snorter of a track, whereas it’s the complete opposite. Its not bad, but its not the best on the album by a long shot. ‘Our Good Goodbye’ is so Toto-esque, I half expect to hear WIllaims/Lukather and Paich to be playing on it! ‘Paradise’ is another of those anthemic arena songs that Lionville seem able to write without and issue. Its like shelling peas for them. I’ve enjoyed the Lionville journey so far. Their debut came out of the blue for me initially, and ‘II’ was also a joy. I think with ‘A World Of Fools’ they have surpassed themselves. Existing fans…it’s a no-brainer. If you have not listened before, what are you waiting for. Its silky smooth, highly polished Westcoast AOR. Its exactly the type of band Toto should take on the road with them.